My friend and fellow ultra-cyclist Adam P. was the one who thought of this ride, and a beauty it is. It has quite a lot of climbing after the initial 25 miles of flats. The scenery is spectacular, however, after you go through downtown Half Moon Bay (near the coast) and start heading back towards the bay through the hills and redwoods. Highly recommended! 10 3 Go on bike trail over Dumbarton Bridge. Continue on, past University Ave., over to Willow Rd. 16 1 R (north) on Middlefield Rd. 17 2 L (west) on Ravenswood Rd. Go a few blocks past El Camino Real; becomes Menlo Ave.
19 a couple of blocks R. (north) University Rd. 20 2 L (west) Santa Cruz Ave. Santa Cruz Ave. eventually turns left; keep on going on that. 29 4 R. (north) on Canada Rd. 33 8 L (northwest, then west) on CA-92. 42 4 L (southeast) on Higgins Purisima. Climb! 46 4 R (west) on Purisima Creek Rd. Climb! 50 2 L (south) on Verde Rd. 52 3 L (east) at fork on Lobitos Creek Rd. (NOT the wimpier Losbitos Creek Cutoff). Climb! 55 4 L (east) on Tunitas Creek Rd. Climb! 59 5 Cross Skyline Blvd. and descend down Kings Mtn. Rd. 70 2 L (east) on Santa Cruz Ave. Note that from this point on you are merely retracing roads you went on earlier in the ride. 72 a couple of blocks R (south) on University Ave.
75 1 R (south) on Middlefield Rd. 76 3 L (east) on Willow Rd. 85 8 L on Thornton/Paseo Padre, back to Central Park. 93 done Finished! Hmmm, I remember that my mileage was closer to the high 90’s, not 93… so maybe somewhere my math or distance estimates are off. If you feel the need to do a few more miles to be closer to 100, go for it! At 9:00 a.m., I stopped by Adam’s apartment, and we rode together from there. The weather was beautiful–wonderfully sunny, and fairly warm. This is not exactly typical for a March Northern CA day–a month where it is just as likely to rain. Unfortunately, this would prove not to be Adam’s day. He was not yet recovered from a lingering cold to start out with, and secondly, it became apparent that his Campy Ergo shifting system was not shifting gears properly! So we stopped at Sir Edwards Regional Preserve, with him holding up his bike and me spinning the crankarm, trying to see why his rear derailleur wasn’t moving properly while he was depressing the shifter button. Odd… at first it seemed like there was way too much friction in the shifter cable housings, but upon peeling back the brake hoods, we found the culprit–a frayed shifter cable at the shifter itself. This is the exact same problem I had in February during a training ride with the Tri-City Tri Club to/from Lafayette–at least before the cable broke and I had to ride back the last 30 miles in my smallest (highest) rear cog. Wonder if this is an inherent weak point when using Ergo shifters, but in both cases for Adam and me, this only occurred after having many, many thousands of miles. We decided to stop by Palo Alto Cycles on University Ave. in Palo Alto to fix this problem. Their mechanics were busy so Adam just bought a cable and I installed it. In the meantime Adam let his friend Piero know that we would be a bit late, and that we’d meet him at the corner of Edgewood and Canada Rd. in Woodside. By complete coincidence we all got there at the exact same time, to the second! We then rode over CA-92, which was more pleasurable than usual for this reason: on a normal day, cars would be passing the cyclists, as this is a highway after all! The narrow shoulder and not insignificant climb doesn’t help matters. Well, on this beautiful day it seemed like everyone was heading over to the beach, so the entire way on CA-92 (all 7-8 miles of it), we were passing the cars, both on the latter downhill section AND the uphill section! And we were having a lot more fun than the motorists stuck in traffic, I imagine. Clearly, on a high-traffic weekend like this, biking to Half Moon Bay was the way to go. After going through the Half Moon Bay downtown, which seems to have a good number of upscale restaurants and boutique shops, was when we encountered the real climbing of the day (as if CA-92 and Edgewood wasn’t enough). 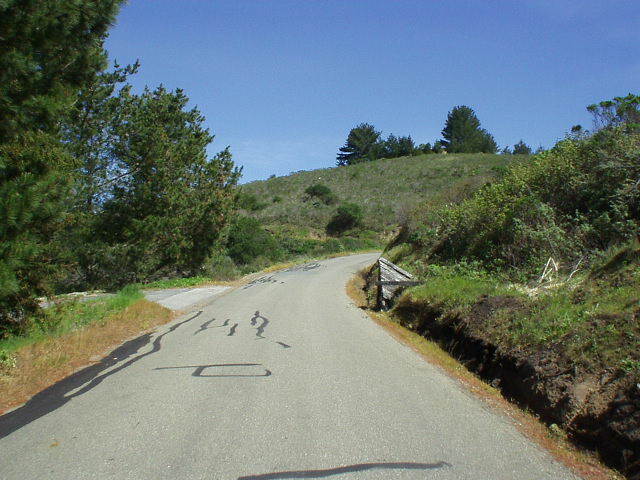 This was the first time I’ve gone up Higgins-Purisima, and then Purisima Creek Rd. (which was really steep! )… and also Lobitos Creek Rd. (which was also really steep in sections). It seemed like there was an organized bike ride occurring here too–not too many riders, but I was impressed that the ones who did do this ride dared to do all of these hills. The climbing only ended after Tunitas Creek Rd., which is a gradual, but fairly long, climb. After all of this and the descent of Kings Mtn. Rd., Adam, who clearly wasn’t feeling well, decided to call it quits, and Piero graciously offered him a ride home. I went back to Fremont alone, which was less than 1.5 hours from Woodside, making it back well before dark. This was one of the best training rides of the year to this point, with great scenery and company!